Psychedelic stoner rock is one of the last things I would have expected to come from Saint Petersburg in Russia, but this is exactly what The Grand Astoria is delivering on their second album II, coming one year after their self-released and self-titled debut. With five songs totalling a generous three quarters of an hour, an the middle track Visit Sri Lanka not even three minutes long, you know from the start that the quartet doesn’t limit itself to short structures. The quarter hour opener Enjoy The View instantly sets the tone with long winded structures, beautiful melodies, an overall sense of embedding freewheeling solo excursions into the context of the song. Apart from some samples, this is all instrumental music played by two guitarists, a bassist and a drummer. The following The Inner Galactic Experience Of Emily Dickinson And Sylvia Plath has a longer title but is otherwise the next shortest piece on the album, and also the only one featuring vocals. This could be from a sweaty American stoner rock band, is executed flawlessly but somehow doesn’t fit the general mood of the record. After the short aforementioned track, the album concludes on two longer pieces, Wikipedia Surfer (9 minutes) and Radio Friendly Fire (12 minutes), that both are similar in temper to the opener. 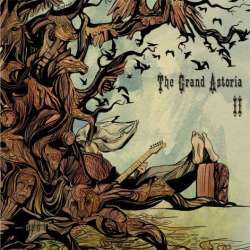 The Grand Astoria have certainly not reinvented instrumental music, but their mix of stoner rock with psychedelic ingredients, which the band likes to label stoner punk, is still very successful, mostly because they never get bogged down in headless improvisations but always keep the song in mind, even if it happens to be over ten minutes long. Fans of stoner rock and handmade vintage psychedelia that don’t mind the predominant lack of vocals will find themselves immersed in a pleasant instrumental journey that gets off much better than those of most likeminded artists.